Been very very long since I did another travelogue...the last time was in 2002 when my wife and I went to Paris for our Honeymoon. This time, it is just a short trip, to Kuala Lumpur (KL), where we have been to 2 times in fact. However, this time is with our BABY!!! Aiken Teo is around 14 months when we went for the KL trip from 17 December 2005 to 21 December 2005 (my Birthday). Initially, we decided on either KL, Taipei or Bangkok, but decided to KL as it will be a short flight as opposed to the rest. Arrived at the airport to check in our luggage and stuff. We made the ultimate wrong choice of eating our dinner at the airport. Not much of any choice and we settled for a $17!!!! dollars chicken rice set for 2. Damn expensive. First time in my life, so expensive chicken rice...hahaha..not very nice also. Regret not taking a photo of the meal. 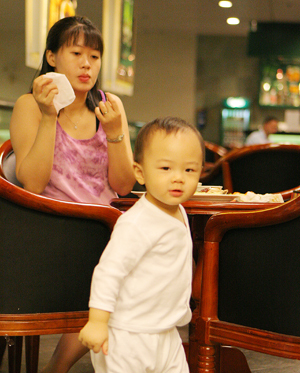 Here's Aiken exploring again as my wife and myself took turns to eat...need to take care of baby as one of us eats. 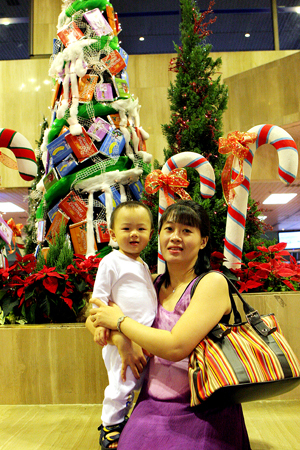 As we made our way to the Gate for boarding, saw this tall X'mas tree where we stop to take some photos. Changi Airport was quite well decorated for X'mas. My wife decided to bring Aiken for a "joyride" on the travellator or whatever you call it...haha..
Can see that Aiken had a great time. Here it is, Aiken's first plane trip on JL721 to KL. Initially, we were quite worried that he might not be able to adjust to the air pressure in the cabin when the plane is taking off or landing. 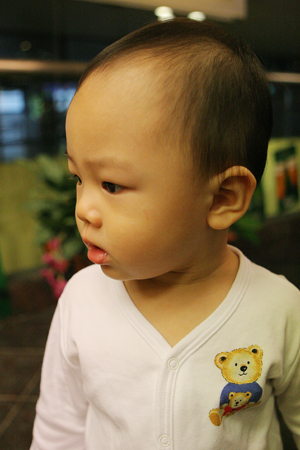 Ended up, he had lots of fun looking at the PTV in front of the plane taking off and the lights out the plane window. 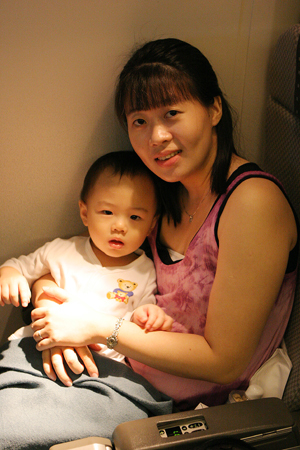 Aiken and my wife, Angelia, posing for a shot in the plane. After an approx 45 mins flight, we arrived at KL. For those who are here first time and not on any package tour, pls remember to buy the airport limo transfer to your hotel from the Kuala Lumpur International Airport (KLIA). You will be able to see the counter after clearing customs and before you step out of the Arrivial Hall. The ticket will look something like the photo. 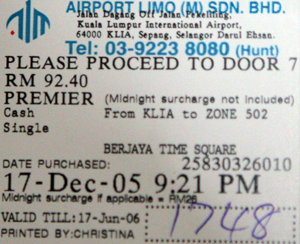 The first time we came to KL, got conned to take those tout cabs and was charged a whopping RM200!!!! After an approx 1hr taxi transfer, we reach our Hotel, Berjaya Times Square Hotel. More info about Berjaya Times Sq can be found on their website. 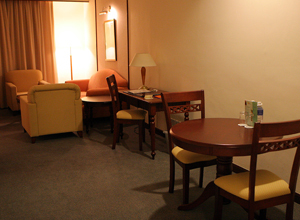 The reason we chose this particular hotel is because it is close to the shopping belt and also every room is a suite. The room itself looks quite nice. We were staying in Room 3814.